I am honored to be apart of a tribute that Dale came up with to honor each and every victim of 9/11. My tribute is to honor Judy Hazel Fernandez, who was taken from this world, far too soon. She was a conscientious and organized person and her position as a benefits Specialist in the Human Resources department was a perfect fit. Judy started at Cantor Fitzgerald in 1998 after she graduated from Rutgers University with a Biology degree. Shortly thereafter she brought her cousin Maria Theresa Santillan to Cantor Fitzgerald. Judy and Maria were not only first cousins but very close friends. Maria was to be married in May and Judy was going to be her Maid of Honor. full of ambition." Since Sept. 11, she said, the words "beautiful, intelligent and caring" loom large in her mind when thinking about her daughter and niece. "She knew what she wanted in life, and she was going to do what she had to do to get it," said her sister, Emma. 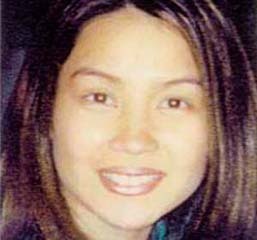 Judy Hazel Fernandez was 27 years old. Beautiful tribute, they were so young. Thank you for this beautiful and touching tribute to my classmate.